In this first serious assessment of the meaning of church division, Ephraim Radner provides a theological rationale for today’s divided church in the Christian West that goes far beyond the standard socio-historical explanation of denominationalism. Through an examination of controversial, post-Reformation discussions about the church, Radner offers a significant theory that describes the relation between Christian division and the work of the Holy Spirit within Western modernity. The book is organized around five areas of “difference” among post-Reformation Protestants and Catholics: authority in the church, the debate over saints and miracles, the ordained ministry, the Eucharist, and the practice of repentance. Through a process of exegesis, historical analysis, and figural mediation of the theological concerns surrounding these topics, Radner sets out an “ecclesiology of division” that, in challenging several key assumptions of contemporary confessional and ecumenical practice, will help lead to a faithful Christian response to the reality of church division. Radner's description of the church is based on the traditional notion that a divided church is, in a significant sense, a "dead" church, after the figure of the pneumatically abandoned "dead Christ," who himself suffers redemptively the disintegration and restoration of divided Israel in his physical and spiritual passion. 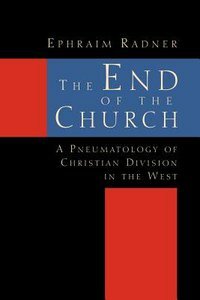 About "The End of the Church"
In this first serious assessment of the meaning of church division, Ephraim Radner provides a theological rationale for today's divided church in the Christian West that goes far beyond the standard socio-historical explanations of denominationalism. Through an examination of controversial, post-Reformation discussions about the church, Radner offers a significant theory that describes the relation between Christian division and the work of the Holy Spirit within Western modernity. Radner's description of the church is based on the traditional notion that a divided church is, in a significant sense, a "dead" church, after the figure of the pneumatically abandoned "dead Christ," who himself suffers redemptively the disintegration and restoration of divided Israel in his physical and spiritual passion. The hermeneutical basis for the usefulness of this figure lies deep in the scriptural practice of the undivided church, and was common up through the Reformation.